When Norm McElheny, who will retire March 1, after 34 years with the Hilliard City School District, arrived in the village in the fall of 1950 to take his position as assistant football and basketball coach, and head baseball coach, the newest street in town was Hamilton Rd. He must have considered McElheny a real catch. “Mac” had started playing football as a high school sophomore in Tiffin and went on to OSU where he played on the Big Ten Championship team in 1944, receiving a varsity letter as a freshman tackle, before serving two years in the United States Navy. Following his military service, he played football four years at Heidelberg College where he obtained his bachelor’s degree in 1950. There he was named to the All Ohio Conference Football Team. “I was never on anything but a winning team and I just liked the feeling,” said Mac recently responding to a question on why he went into coaching. One of the factors in his decision to take the Hilliard job was that he would be assistant to Coach Everett Farenholz who was in the process of obtaining his law degree and planning to leave at the end of the year, placing his assistant in line for the head coaching position. Mac served as head football coach for 21 years, with 110 games won, 68 lost, and 9 tied. His team won the Mid-Eight League Championship four years in a row (1959-1962) and tied with Grove City for the Championship in 1969. 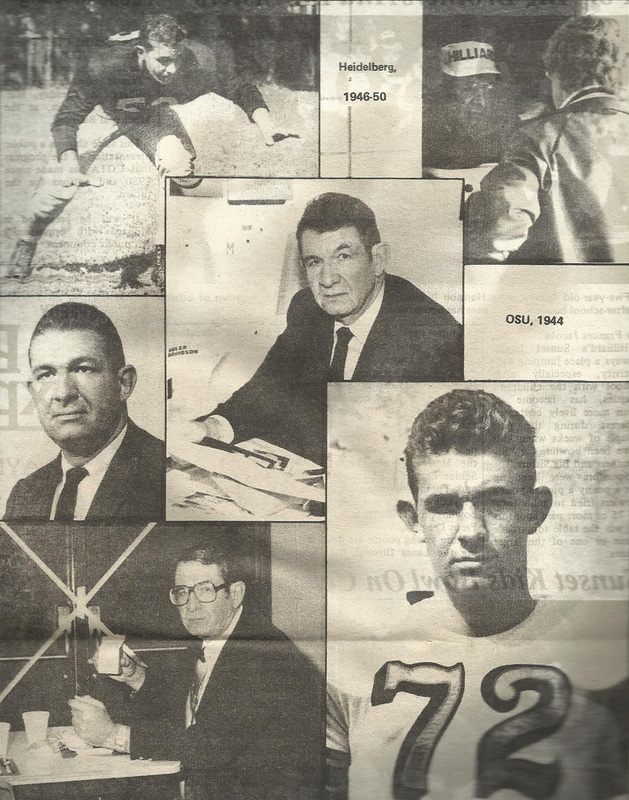 In 1962 Mac was named “Central Ohio Coach of the Year,” an honor co-sponsored by the Citizen-Journal and the Union Company. Which was not too difficult to do in those days of few extra curricular activities. Another thing, not generally realized, Mac said, is that Hilliard, even as a small village, served a very large school district- with a much greater area than the district currently has. Mac arrived in town just in time to see the stadium built in 1951, with the help of the first Boosters’ club. “I’m probably the oldest active Booster,” he laughs. In 1969 the structure was razed after it was declared unsafe and the Boosters, now a strong organization, again rallied to rebuild it with three times the seating capacity, a new press box, and other improvements. “We’ve never regretted staying,” he said. In addition to their school duties, the McElheny’s, parents of three grown sons, all in business, are church members and active in the community. In the days when all teachers and coaches had to supplement their incomes through summer work, Mac also recalls Hilliard was “a good place for summer employment…” Some of his summer jobs were with Leo Shade, at Hilliard lumber, and with Mart Boerner, the plumber. Mac is also pleased to recall that he was trusted for a loan by banker Chris O’Brien. One of Mac’s areas of expertise is in business and throughout the years, up until his retirement, he has taught a variety of business courses at the High School. His master’s degree was obtained from OSU in 1965. Mac also coached track from 1951-57 and reserve basketball from 1951-54. He started the sport of wrestling at the school and coached it from 1957-58, started tennis at the school in 1972. Mac became Faculty Manager and Athletic Director in 1958 and has been full-time Athletic Director, with some teaching duties, since 1972. In 1974-75 he served as President of Central Ohio District Athletic Directors, and has been selected for the Ohio Athletic Directors Hall of Fame. But all his honors do not mean as much to him as his memories of the athletes he has seen pass through Hilliard High School in his 34 years there and his continued friendship with them. “I’m tremendously proud of the good citizens they have become,” he said, explaining that they may be found pursuing successful careers in all walks of life. A former Hilliard football player, for example, is president of General Motors in Canada. Another is an outstanding Columbus gynecologist, and the list could go on and on. The saddest of Mac’s memories are of football players who met premature deaths. Pulling from his file the photo of a young player in uniform, he comments on the death of Rick Hausman, an outstanding football player on one of his most outstanding teams, who went to OSU and was later killed in Vietnam. Mac’s retirement plans were not fully formulated last week, but he is sure to be doing some of the things he never had time for in his busy career which left very few leisure hours. 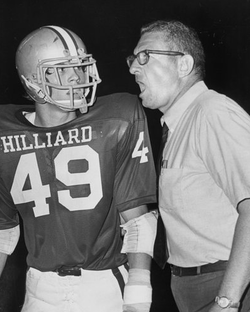 In honor of retiring, Athletic Director Norm McElheny, who for 21 years was head football coach at Hilliard High School (1951-72) , the News last week decided to contact some of his former players to find out “what kind of coach” he really was. From the hundreds who could have been selected, only a few former players were called, and they were chosen by a method no more scientific than who happened to be home when the telephone rang after a few likely names of former football players were picked. But even in this small random sampling, there emerged a crystal clear picture of “Mac the Coach,” and the News learned that he is a man who has had a lasting influence in the lives of his students. ED PALMER - Assistant Principal at Westland High School, in charge of student activities, including athletics, a former Hilliard Coach. PETE MILLER - Hilliard businessman, who as a student set the national record in discus throwing. CHUCK BOYER - Annapolis, Maryland; played football at the Naval Academy and became Navy Coach. MR. & MRS. JERRY BAUM - Hilliard businessman and longtime Booster who has not missed a football game, either at home or away, in 31 years. Mrs. Baum had Mac for business courses.